I’ll be honest – during my three months in the region, I saw Central Asia’s cities primarily as places where I could find a larger food variety, reasonable WiFi, and working air conditioning. Karakol, though, was different. Upon arriving on the dusty streets of this large village in the Issyk Kul region, I was blown away by the variety of things to do in Karakol. After spending several days here, Karakol is one of the few cities I’d recommend in Kyrgyzstan to visit simply to see the city and its surroundings. Yeah, it’s that awesome. But what exactly set Karakol apart from other villages in Kyrgyzstan and Central Asia? For me, it was the refreshing variety of activities and adventures available to travelers. Want to go on an intense multi-day trek? Eat to your heart’s content? Learn about the history of Kyrgyzstan? You guessed it, I did all of these things and more while traveling in the Karakol area. While there, I learned to bake bread, marveled at colorful mosques and churches, and ate my weight in Dungan food in Ashlyanfu Alley. (Yeah, that’s a thing.) If you’re still not convinced about visiting Karakol, read on for my list of amazing things you can do in and around the city. When I’m in a new city, I always love to take the city’s free (tipped) walking tour. Sadly, most cities in Central Asia don’t offer such a thing, but Karakol does and their tour is AWESOME. Our guide, Aman, speaks perfect English and knows basically everything about Karakol’s history and the surrounding regions. It’s easy to tell he’s incredibly passionate about sharing his knowledge with tourists and showing them the best his city has to offer. Spoiler alert: the tour takes you ALL OVER Karakol’s main attractions, through the main square, into the historic buildings (mentioned below), to a few other amazing secret places, and ends at my favorite food stop in the entire city. But in order to find out what those secret places actually are (and the surprise at the end), you’ll just have to take the tour for yourself! Karakol is unique because it’s one of the few Central Asian cities known specifically for its food. Because there are many ethnic groups who have inhabited Karakol, there’s a ridiculously awesome variety of cuisine here. Foodies will love the many culinary influences in the area, and can get hands-on with it by participating in one of many culinary experiences for tourists. So, if your taste buds are aching to try new and exciting foods, Karakol’s got you covered. To book a food tour in Karakol, get in contact with Destination Karakol by clicking on the tour links above. 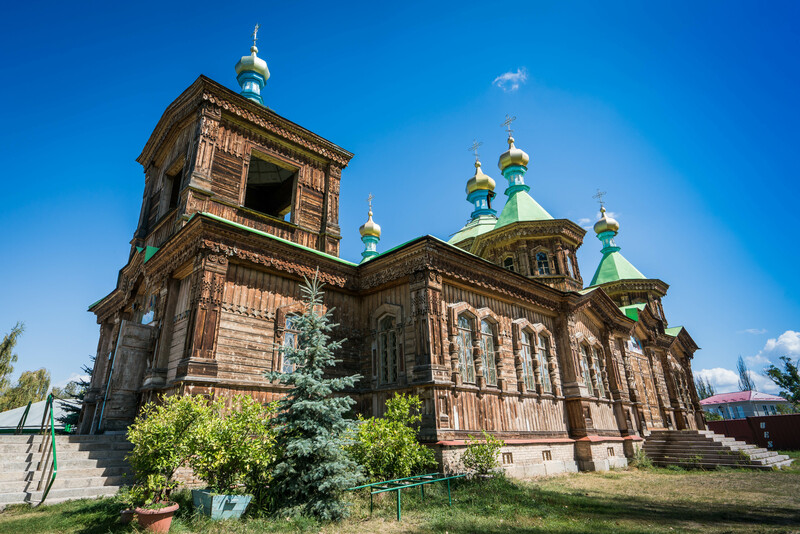 There are two main noteworthy historic structures in Karakol: the old mosque and the wooden church. Both are absolutely beautiful constructions and are worth a visit, especially early in the morning or late in the afternoon when the sun is low in the sky. The mosque was originally built by the Dungans and is still in operation, boasting a colorful, hand-painted exterior with a Chinese-influenced design. Today, its grounds are quite small, but you can see the mosque building and its minaret, which are some of the brightest buildings in the entire city. The old church is another historic structure worth visiting. With its sparkling domes and wooden exterior, it has a very unique look to it and is unlike any other church I’ve seen. Our guide told us that they’re planning to repaint the church soon, but I personally like it with the stained wooden facade. Karakol’s city museum isn’t your run of the mill small town museum. Sure, it’s smaller than the behemoths in the capital cities, but it’s chock full of artifacts, traditional clothing and designs, an incredibly fascinating photo exhibit, and…a strangely large taxonomy collection… Anyway, for the history lovers out there, the Karakol Museum is a must. I was really surprised by the lack of souvenir shops in Kyrgyzstan, especially given that it’s a rapidly growing destination for international travelers. I mean, in general, it was a good thing for me because I get all googly-eyed at colorful clothes and spend WAY too much money on them…but anyway. But sometimes, I just wanted to walk around a few stores and look at the beautiful traditional handcrafts and artisan goods from Kyrgyzstan. And that’s where Karakol became very, VERY dangerous. You see, Karakol is full of small, boutique shops of the charming variety. And I’m not just talking souvenir shops (although they have those too). There are TWO bustling, busy markets with everything from home goods to clothes to unidentifiable Kyrgyz foods and more. There’s also an adorable antiques shop full of odds and ends from the Soviet era, a place a history junkie or a hoarder (AKA me) could probably spend forever in. In addition, my favorite place was a lovely souvenir shop – One Village One Product – that I went to three times because I couldn’t decide whether I wanted to buy honey…or soap…or bags…or hats…or……… (I ended up buying all of the above, btw). So yeah. If you have a shopping problem, Karakol might ruin you for life. 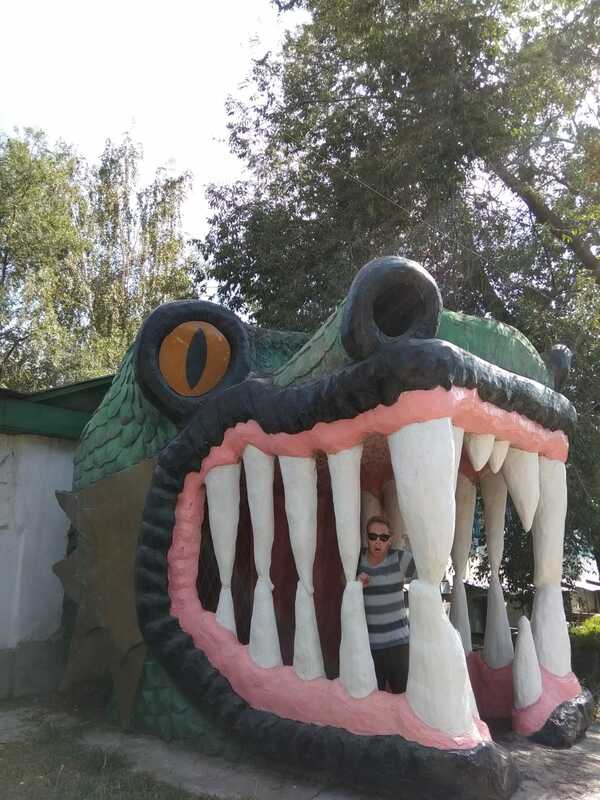 While we’re on the topic of unique things to do in Karakol, you can’t miss what’s arguably the most unique thing in the city – a gaping dragon’s mouth, located right smack in the middle of the sidewalk. The dragon used to be an entryway for an old bar which closed several years ago, and now it stands as an unofficial city landmark and is primarily used by tourists for the ‘gram. I was honestly too shy to do it for the ‘gram, but my friends at Travels of a Bookpacker have got me covered (photo above). Jeti Oguz is a beautiful red rock formation hidden just a few kilometers from Karakol. It’s undoubtedly one of the best things to do in Kyrgyzstan. Luckily, if you have a free day and want to see it, it’s easy to hop on a marshrutka and take a look for yourself. When you arrive there, towering, vibrant rock formations in the form of seven “bulls” will greet you, and a walk around the area yields different views and even more formations to explore. While you can spend the night in Jeti Oguz, it’s also completely doable as a day trip from Karakol. To get to Jeti Oguz, shared taxis congregate near Karakol’s Main Bazaar throughout the day. Be sure to get a head start in the morning to maximize your time in Jeti Oguz. The shared taxis should cost 150-200 som per person (some negotiating required) and take about 1.5 hours to arrive. To return to Karakol, you can almost always find a ride near the bridge or on the main road in the direction of Karakol. I don’t consider myself a foodie, but I sure do love trying new cuisines, and Dungan food was no exception. After being introduced to ashlyanfu in Karakol and almost crying because I loved it so much (you can ask the other folks I met in Kyrgyzstan, it’s true), going to Yrdyk for an entire Dungan dinner was like heaven. During the dinner, which took place in a family home, not only did I get to learn about Dungan history and traditions, but I also got to see how ashlyanfu is made (and eat A LOT of it). I left the dinner stuffed so full I could barely walk, taste buds brimming with happiness from the unique flavors and ingredients I got to try. If you decide to take this tour, make sure you come EXTRA hungry because it’s a lot of delicious homemade food. To book the Dungan Family Dinner tour, click here and send in a request on the web page. Dungan Family Dinner tours to Yrdyk happen daily but are subject to change based on demand. If you’re tired from trekking/walking/shopping/eating and just want to sit back and relax to the sound of the water lapping the side of a boat, I don’t blame you, I’ve felt that way too. Luckily, there’s a wonderful sunset yacht cruise on Issyk Kul Lake that departs from just outside of Karakol, and it’s calling your name! On the cruise, you can enjoy beautiful views of the lake and the surrounding mountains while relaxing on a beautiful boat. The cruise lasts 1.5-2 hours and there are complementary beverages on board. To book the Karakol sunset yacht cruise, click this link and submit your reservation. Tours are dependent on demand. Trekking in Kyrgyzstan isn’t for the faint of heart, but the views are totally worth it. This is arguably Kyrgyzstan’s most popular multi-day trek, and for good reason – it’s gorgeous! The trail leads up a steep incline to a spellbinding glacial lake surrounded by rocky peaks, and then leads to a dramatic valley with a hot spring where you can rest your tired muscles and PTFO in a yurt for the night. Sounds pretty ideal to me! While the trek is very challenging, it’s doable for most people with reasonable fitness and a willingness to get down and dirty on some really steep inclines and descents. The other great thing about this trek is that there’s no need to bring a tent, food, or sleeping bag because there are pre-established camps along the way that provide them for tired hikers at a reasonable price. I didn’t do the full hike, but my friends and fellow travelers at Travels of a Bookpacker wrote a super helpful post on trekking to Ala Kul and Altyn Arashan without a guide or gear. Give it a read before you head out to the wild! There’s so much variety and color in Jyrgalan Valley! While Jyrgalan isn’t in Karakol, I figured I’d throw it on this list for a number of reasons. First, it’s incredibly peaceful and beautiful there, as it’s nearly 2 hours from Karakol. And second, you have to travel through Karakol to get to Jyrgalan in the first place. If you’re looking for ways to extend your travels on the east side of Issyk Kul, Jyrgalan is the perfect place. Jyrgalan is literally a hiker’s paradise. People come here to get outdoors. With day hikes, multi-day treks, and horse trekking available, you could spend a week or more here without getting bored. For more information and inspiration on things to do in Jyrgalan, check out this Jyrgalan write-up by my friend Richard from Travel Tramp, or head over to Destination Jyrgalan Valley’s website. Karakol also offers a bunch of other adventure activities, from paragliding to mountain biking to horseback riding and more. If you’re looking for a specific activity or tour, the folks at Destination Karakol are super helpful and can connect you with the right people to make it a reality. There are basically two ways to get from point A to point B in most of Kyrgyzstan: take a marshrutka or hire a driver. Hiring a driver will cost you much more than taking a marshrutka, but if you’re pressed for time or would rather not be smushed up against a total stranger for 6 hours in very close proximity, it’s the most comfortable and convenient option. Marshrutkas are shared mini buses that operate as inter-city public transportation in most of Central Asia. Drivers usually wait until the van is full before they leave for the destination, making timing and scheduling nearly impossible. There are marshrutkas that run directly between most notable cities in Kyrgyzstan, including Karakol. Below I’ve detailed some of the main routes you may take. There are regular marshrutkas throughout the day from Bishkek’s central bus station that leave when they are full. From my experience, it’s generally easier to catch a marshrutka to Karakol in the morning or early afternoon. The journey costs ~300-400 KGS and lasts ~6 hours with a few stops in between for snacks, water, and restrooms. Shared taxis, which seat 3-4 people, are also usually available at the bus station for a slightly higher price. Regular marshrutkas and shared taxis leave Bokonbaevo’s city center for Karakol throughout the day. Cost is 150-200 KGS. Again, it’s easiest to find one that fills up and leaves quickly earlier in the day. There’s ONE daily direct marshrutka from Naryn to Karakol (and the other way around). It usually fills up and leaves before 8 am. So, if you want to take this marshrutka, be sure to get to the Naryn bus station early to ensure that you claim your seat. Otherwise, you’ll have to take a marshrutka to Balykchy and change over to a Karakol marshrutka from there. Mid-range to high-end travelers will enjoy the Karagat Hotel, which has comfortable and spacious rooms with upgraded amenities. It’s a short walk from most of the city’s main attractions, bazaars, and dining establishments. Budget travelers have their pick of a variety of guest houses and hostels in the city. I stayed in a hostel I wouldn’t recommend, but other budget travelers recommend staying in Duet Hostel. This post was made possible by the support of the American People through the United States Agency for International Development (USAID) Competitiveness, Trade, and Jobs Activity in Central Asia. The contents of this publication are the sole responsibility of Jetfarer and do not necessarily reflect the views of USAID of the United States Government.